Chlorophyll is the green pigment found in most vegetables. The pigment uses photsynthesis to absorbs the sun's rays. The vegetable kingdom provides us with a means to harness the sun's energy! A Chlorophyll molecule is often compared to the hemoglobin molecule in our own blood. Iron is the central atom in our blood and in chlorophyll it is magnesium. Dr. Richard Willstater declared in 1913, that chlorophyll is to plants, what blood is to humans. There is a saying that says... "green inside, clean inside." The chlorophyll capsules produced by some companies such as Nature's Sunshine are produced with the magnesium molecule intact. The chlorophyll liquid has been rendered water soluble by replacing the magnesium molecule with a copper molecule. Chlorophyll liquid helps digestive problems, gas, bloating, an overly acidic stomach and against allergies. It also boosts up the immune system response, helps to eliminate food irritants and to cleanse the blood. Capsules cleanse and repair the intestine, help the liver produce bile, helps with constipation, osteoporosis, menopause, joint pain, allergies, as a natural source of magnesium, to reduce acidity in the blood and to calm the nervous system. 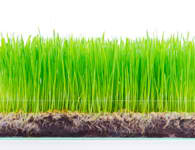 Chlorophyll health benefits abound, add some to your supplements and feel the amazing results.